Fibre optic communication solutions specialist, AFC Group introduces the new SmartClass Fibre OLP-87 FTTH PON meter and OLP-82 power meter. Designed as an optical handheld that combines high accuracy power measurements with PASS/FAIL fibre inspection into a single portable device, JDSU SmartClass power meters drive user workflow and behaviour, encourage best practices, and improve overall quality of work with integrated certification. 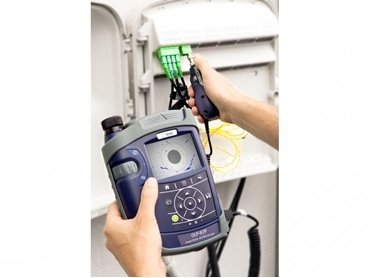 The power meters reduce the number of tools and peripherals required to be carried into the field and correctly enable installation, commissioning or troubleshooting of fibre anywhere in the network. Fibre connectivity is rapidly expanding into new environments such as FTTH (Fibre To The Home) and FTTA (Fibre To The Antenna). As user bandwidth demands increases, the margin for error in network performance is drastically reduced. Each connection point is a potential risk for signal loss and damage as contaminated connectors are the primary cause for problems in optical networks. Network owners are therefore, protecting their investments by demanding compliance to industry standards for endface cleanliness such as IEC 61300-3-35. Consequently, technicians need to be equipped with tools that allow them to certify standards compliance for power/loss and connector quality, while utilising systematic and proactive methods that are fast and accurate. The increased implementation of fibre has resulted in network owners having to employ unskilled workforce to keep up with installation labour demands and project time pressures, which also translate into significant training costs to make the fibre technicians field-ready quicker. Offering ease of use and intuitive operation, JDSU SmartClass fibre tools help network owners create fibre-smart technicians quickly without the huge overheads for training.